When we see a new wrinkle on our face, we immediately notice it. 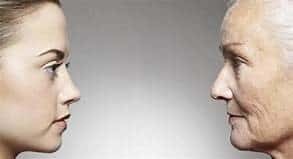 However, we don’t often take the same precautions with our neck, as we do with our face. Perhaps we don’t moisturize as well, or remember to apply some kind of SPF protection if going out in the sun. However, our neck’s skin is one of the most delicate on our bodies! That means that to keep it looking and feeling young, we need to properly take care of it. The answer? One of the best neck creams! We’ve got them all right here for you! Let’s get started! Now that you’ve had the opportunity to do a quick read-through of each of the best neck creams, you’re probably wanting to read more about them. Scroll down a bit further, where you’ll find in-depth, unbiased reviews of each product! As previously mentioned, when it comes to aging and wrinkles, it’s not just our face that’s affected; it’s our neck, too! That’s where the PureBiology Wonder Firm Neck Firming and Lifting Cream comes in. 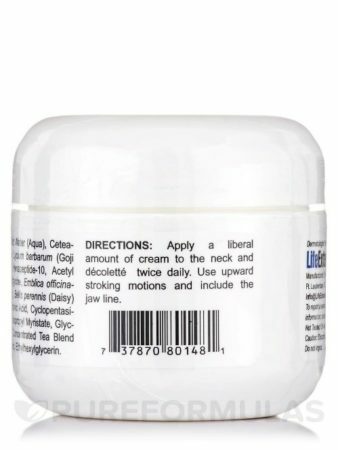 This neck cream is specially-formulated for the neck and chest. The difference is that many face creams are heavier, as is the skin on the face. The skin around the neck and chest is much more delicate and thin and requires a product which takes that into consideration. It is naturally-hydrating, healing, and filled with collagen-boosting ingredients such as: Shea Butter, Argan Oil, as well as Hyaluronic Acid. Oh, and we can’t forget the two proprietary complexes which work to lift and firm, while simultaneously reducing the appearance and occurrence of fine lines and wrinkles. The formula makes use of various proteins and polysaccharides to create a film which lifts, firms and tightens skin. You will see results just after a few hours, however, you’ll continue to see long-term benefits with consistent use. If you have sensitive skin, you’ll love this, too. As the skin around the neck and chest is thinner, it is also more sensitive. Something that is fine on your face may cause an allergic reaction to your neck. That’s just one reason why it’s so important that the formula is comprised largely of plant-based ingredients, and is free of parabens and GMOs. Really, the only downside is that it’s just made for the neck and chest. If you want something for the face, check out any of the other great options we have on our list. 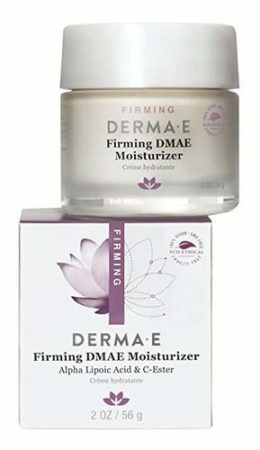 One of the best facial products for women while still firming the neck, is the DERMA E Firming DMAE Moisturizer. 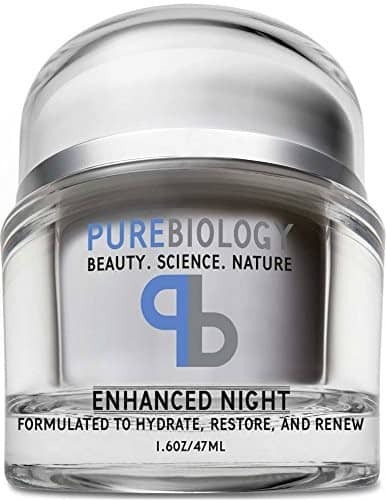 Marketed as a revitalizing, brightening daily moisturizer that works to improve the appearance of the face and neck skin, we knew we had to see what the fuss was about with this stuff! This skin tightening product works to help eliminate and/or reduce the appearance of fine lines, wrinkles, as well as a general unevenness of skin tone that seems to happen more often as we age. The good thing about this, is that the Derma E Renewing Moisturizer helps with all of these! 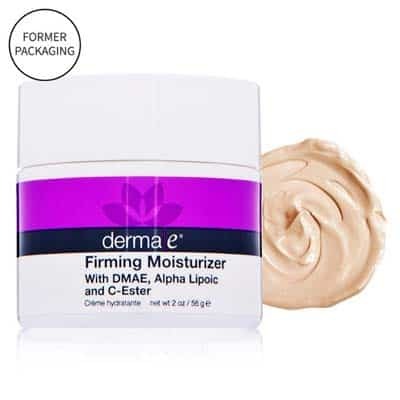 Well, the cream contains a blend of Vitamin C and Alpha Lopoic Acid; both, which work to protect the skin’s cellular structure, boost antioxidant function, as well as improve the appearance of wrinkling, skin tone, and overall roughness. This can be one of the main causes of crepe-like skin, however, as we age, we also tend to lose moisture. This is why the Jojoba Oil included in the cream is so welcome! It works to hydrate the skin, and blur fine lines and wrinkles, while Vitamins A and E nourish the skin to give it an overall better appearance. Something else we loved about this skin tightening product? That they work to create eco-ethical products that are good for the planet, from packaging to the product, itself. Their products are 100% vegan, cruelty-free, sulfate-free, mineral oil-free, Lanolin-free, gluten-free, and GMO-free. For best results, you’ll want to apply an even layer of the moisturizer to your skin after it’s been cleansed and toned (preferably). You can use it how you’d like, really. You can use it once or twice a day – either or both in the morning and at night, so if you have a crazy schedule, you’ll really like this one. Although the cream does protect against many environmental hurdles, it’s still a good idea to apply at least SPF 30 if you want to minimize the aging affects the sun can have on the skin. So, what kind of results did we see? We were very pleased upon first usage. Immediately, the skin felt smoother and more hydrated, and even looked more hydrated and plump! Not only that, but after a few weeks of use, we really started to see our skin tone becoming more even, along with a noticeable (slight, but noticeable) tightness and lift of the skin under the chin! The fact that the cream contains strong fragrances. This is a downside for various reasons. One, because these can irritate sensitive skin, and two, because the fragrance is unpleasant for many users. While the smell doesn’t last that long, it can be a bit annoying for the time it’s lingering. What is crepey skin? It turns out you may just have it and not even know! Crepey skin is where the skin becomes very thin, dry, and seems to fold over itself like one would expect over a kind of crepe material. This kind of skin is seen frequently in very elderly people, but it can also occur to younger people as well. It begins due to the collagen and elastin fibers which give the skin it’s structure and hold it in place, tight against the muscle. Over time, as they continue to break down, the skin will become thinner, drier, and look more “stretched out” or even a bit saggy and lifeless. We’re guessing you don’t want that. 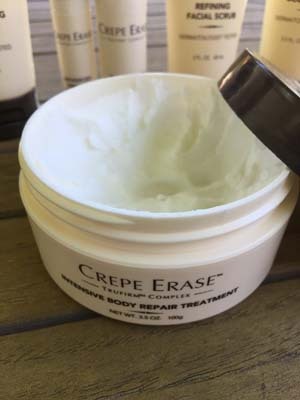 One way to treat this, is by applying a plant extract complex, called “TruFirm”, and they’ve included it in Crepe Erase! 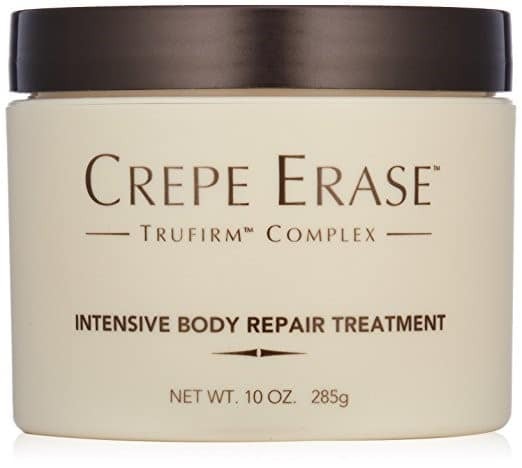 However, it’s not just TruFirm which gives the impressive results Crepe Erase is known for. Shea Butter, Cocoa Seed Butter, Cocos Nucifera Oil, and Olive Oil are also important ingredients which work to hydrate the skin without making it feel greasy. In fact, something odd we noticed, is that pretty much all of the ingredients are known just to hydrate the skin, rather than support collagen production. So, while we did see a definite improvement in the plumpness of the skin and consequently the appearance of wrinkles, we are going to assume this is due to the added moisture, rather than a higher production of collagen. It varies depending on the size, but it is pretty average-priced considering how much product you get and the fact that a little goes a long way. It also comes with an exfoliator in addition to the cream. The reason why it really made our list though, is because you can use it for all over your entire body. If you’re having issues with the neck skin starting to sag, but also in other areas of your body, then you’ll love this one. You won’t have to put out the money for two products, and can save on just using the one. The fact that it doesn’t boost collagen production or at least help with the structure that supports the skin. While you will probably see results, we prefer a more complete solution. Looking to rejuvenate and restore your skin while stopping any future damage from happening? 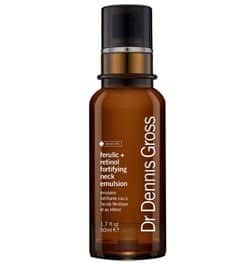 Then check out Dr. Dennis Gross’ unique product which delivers lactic acid, ferulic acid, retinol, and amino aids to give you strong, plump, and rejuvenated skin in a hurry! The quick-absorbing, collagen-enriched emulsion works to also strengthen and firm the under-chin and jawline area to give a tighter, younger-looking contour. It’s specifically made to target the often-neglected, delicate skin of our neck, and works to hydrate it, while also making the skin healthier in the process. Their signature combination of Ferulic and Retinol is what really stood out to us. Ferulic Acid has been known and proven to be essential in the anti-aging process, and it’s an antioxidant which works to hunt out and get rid of various free radicals which can speed up aging. Retinol, on the other hand, works to exfoliate, smoothing the texture of the skin, and helping to eliminate the appearance of fine lines and wrinkles. To boost collagen and elastin production, they’ve included amino acids, and even have some watermelon, ellagic acid, phospholipids, and more. However, it’s not all purity here. They also have a couple potential irritants, which could be too much for some of those with sensitive skin. While negative reviews seem to be somewhat rare, keep in mind that it is a possibility if you’ve had adverse reactions to similar products, before. We did see noticeable results in as little as a week, but this was mostly just an improvement in hydration and skin evenness. After a few weeks is when we really began to see an improvement in the tightness of the skin. Probably our biggest complaint was the bottle design. It is a bit difficult to squeeze as much as you need out, due to the lip underneath the pump being too far out and leaving no room for your finger/hand to neatly catch the product. Clarins is one of the most well-known skincare brands around the world, and for good reason! They consistently produce high-quality, effective products, and this best neck firming cream is no exception! 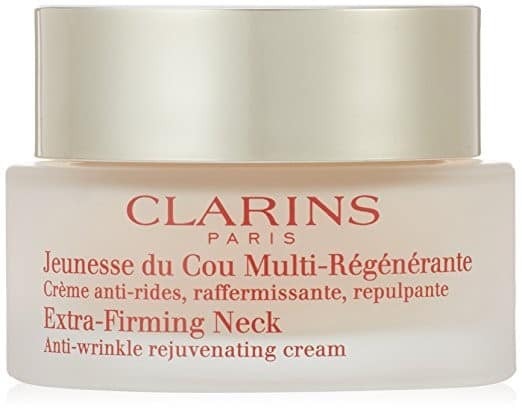 Clarins Skin Care’s Extra-Firming Advanced Neck Cream is one of the most effective neck creams, which works to firm and tighten the skin over and around the neck. They know how delicate the neck skin is, and how much it’s often neglected. However, it’s just as important to place a focus on the quality of your neck cream. This one works to tone the decollete and neck, smoothing any wrinkles, fine lines, and uneven textures. The cream will keep you looking your freshest, youngest, and healthiest! So, just how exactly does it work? Well, once applied on the neck and decollete, a stimulant in the formula works to take action on the existing skin cells, and help preserve their health/firmness for a longer period of time. The plum extract works to also lift, while smoothing the skin so it feels silky soft, helping to blur fine lines. Not only that, but it also works to boost collagen production, making skin plumper, stronger, and more youthful-looking. It’s probably the most luxurious, pleasant-feeling product out of all of the neck creams we tried. It’s very lightweight and not oily whatsoever – a stark contrast to most of the others on the market today. The scent is also not offensive, and is very gentle and mild. So, let’s talk about what we didn’t like. Really, the only downside for us, was the price. In comparison to many others, and really just generally speaking, this is a pretty expensive neck cream. With that being said, you’ll only want to apply the product in the affected areas that you want to improve so as to not waste the product. If you have dry skin, you’ll also love how it makes you feel! After first applying the products, we felt dry skin relief immediately. Now that you’ve had the chance to look at each of the best neck creams, have you decided on the right one for you? If you still haven’t made a decision or are unsure of which one is right for you, that’s okay! That’s why we’ve gone ahead and created the buying guide below, so you can feel confident in your selection! First of all, it’s very important to consider the ingredients of your new neck cream. As previously mentioned, the skin of the neck is very sensitive. That doesn’t mean it’s just sensitive with how it ages, but also how it reacts to certain products. In fact, many users have never even had a kind of adverse reaction with a cream before, and as soon as they apply it on their neck, they begin to see irritation. That’s why it’s so important to really look into what you’re putting on your skin. If you have any kind of sensitivity to certain products, then take that into consideration. If you have sensitive skin in general, then try to pick a product that doesn’t have potential irritants in it. These irritants typically come in the form of alcohols or artificial fragrances, which can dry out the skin, causing redness and irritation. What kind of results to you want to see, and what is your skin’s current state? Think about these two questions before looking at or at least deciding on a cream. Is your skin mainly suffering from dryness? Or perhaps it’s nice and hydrated, but still sagging? If it’s dryness that you’re dealing with, then almost every one of these creams would be a good option. If you need something stronger, as in something that’s going to lift and firm the under-chin/jawline area, then you’ll want something more complete, and complex. These may cost more money, however, it’s not a rule. 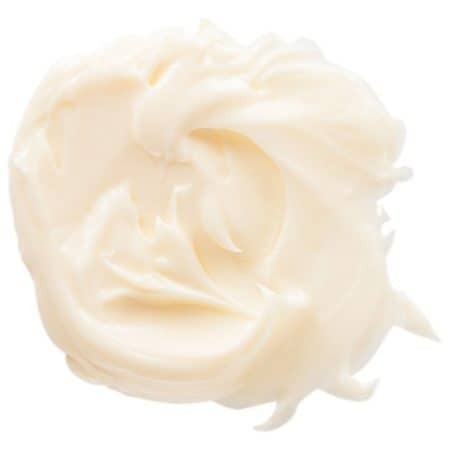 What kind of texture do you like in a neck cream? If you want one that is very thick and luxurious, you may be out of luck here. 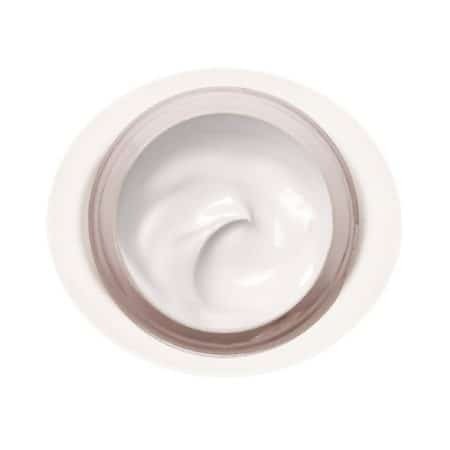 Most neck creams are thinner than your typical face or body lotion, due to the fact that, yep – you guessed it – that it’s more delicate and thin. However, some people really love the greasy feeling, as they feel like it’s working more effectively at hydrating/moisturizing the affected areas. In contrast, many people also don’t like the feeling, and would prefer a lightweight, non-greasy cream that does the job and leaves no trace. This goes a bit hand-in-hand with our first point, but think about the kind of fragrance you would prefer (if you want one at all). Fragrances not only affect our noses, but also our skin. They can often dry out skin, so common sense says that the more effective products should either be artificial-fragrance-free, or have a very mild fragrance added to it. If you aren’t sure what the fragrance is, we have all the info right here for you. We all know that we think about price when purchasing a new product. Even if we can afford a billion jars of the most expensive cream in the world, that still doesn’t necessarily mean we wouldn’t place value on certain products according to their price tags. Think about a price that you’d feel comfortable spending, and try to stick to that. This is to help eliminate the chance of buyer’s remorse. While these are all incredible products, there are just some users who honestly won’t be consistent with it and won’t see results due to that. Also make sure to take into consideration how long your jar/bottle is going to last you! Many products are of similar prices, but if you start thinking about the price per application, things start to become clearer. Even just purchasing the same size of jar isn’t going to say as much, because with some you’ll only require a small dot, and others, a large handful to get the same job done. Now that you’ve read just about everything you need to know about all of the best neck creams, have you decided on the one for you? 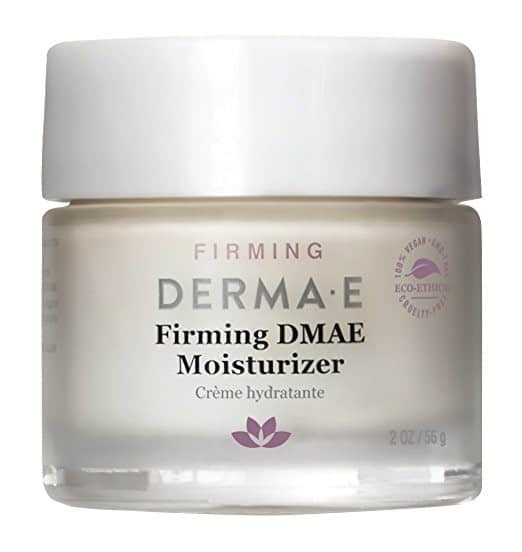 If you haven’t, allow us to reiterate how much we love the DERMA E Firming DMAE Moisturizing Cream. First of all, it’s very easy to use, and one of the quickest-working on the market today. We began to see a difference just after the first use. Next up, is the fact that it’s actually really inexpensive, especially in comparison to the other products we’d tried. The cream is vegan, cruelty-free, gluten-free, and sulfate-free, which makes it available to just about anyone out there who supports products that are better for our planet. Oh, and did we mention what an amazing price it’s listed at? It’s one of the least expensive on the market today, and it’ll last you for month.